Obviously memory accesses and memory management are a very important part of modern computer operation. Every instruction has to be fetched from memory before it can be executed, and most instructions involve retrieving data from memory or storing data in memory or both. The advent of multi-tasking OSes compounds the complexity of memory management, because because as processes are swapped in and out of the CPU, so must their code and data be swapped in and out of memory, all at high speeds and without interfering with any other processes. Shared memory, virtual memory, the classification of memory as read-only versus read-write, and concepts like copy-on-write forking all further complicate the issue. It should be noted that from the memory chips point of view, all memory accesses are equivalent. The memory hardware doesn't know what a particular part of memory is being used for, nor does it care. This is almost true of the OS as well, although not entirely. Memory accesses to registers are very fast, generally one clock tick, and a CPU may be able to execute more than one machine instruction per clock tick. Memory accesses to main memory are comparatively slow, and may take a number of clock ticks to complete. This would require intolerable waiting by the CPU if it were not for an intermediary fast memory cache built into most modern CPUs. The basic idea of the cache is to transfer chunks of memory at a time from the main memory to the cache, and then to access individual memory locations one at a time from the cache. User processes must be restricted so that they only access memory locations that "belong" to that particular process. 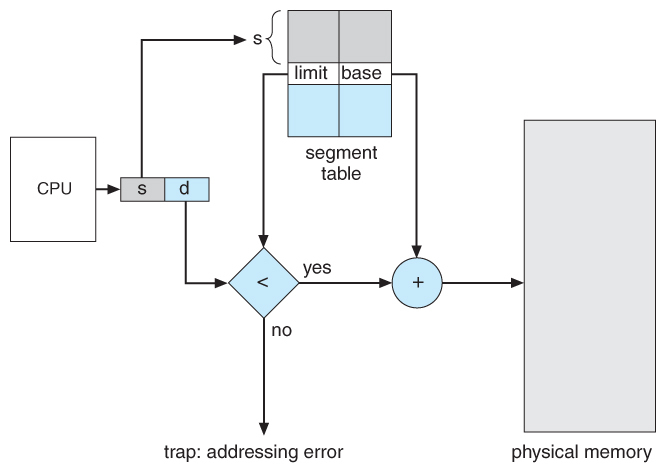 This is usually implemented using a base register and a limit register for each process, as shown in Figures 8.1 and 8.2 below. 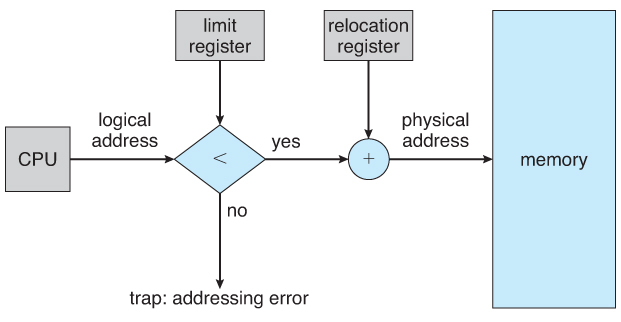 Every memory access made by a user process is checked against these two registers, and if a memory access is attempted outside the valid range, then a fatal error is generated. The OS obviously has access to all existing memory locations, as this is necessary to swap users' code and data in and out of memory. It should also be obvious that changing the contents of the base and limit registers is a privileged activity, allowed only to the OS kernel. Compile Time - If it is known at compile time where a program will reside in physical memory, then absolute code can be generated by the compiler, containing actual physical addresses. However if the load address changes at some later time, then the program will have to be recompiled. DOS .COM programs use compile time binding. Load Time - If the location at which a program will be loaded is not known at compile time, then the compiler must generate relocatable code, which references addresses relative to the start of the program. If that starting address changes, then the program must be reloaded but not recompiled. Execution Time - If a program can be moved around in memory during the course of its execution, then binding must be delayed until execution time. This requires special hardware, and is the method implemented by most modern OSes. The address generated by the CPU is a logical address, whereas the address actually seen by the memory hardware is a physical address. Addresses bound at compile time or load time have identical logical and physical addresses. Addresses created at execution time, however, have different logical and physical addresses. In this case the logical address is also known as a virtual address, and the two terms are used interchangeably by our text. The set of all logical addresses used by a program composes the logical address space, and the set of all corresponding physical addresses composes the physical address space. 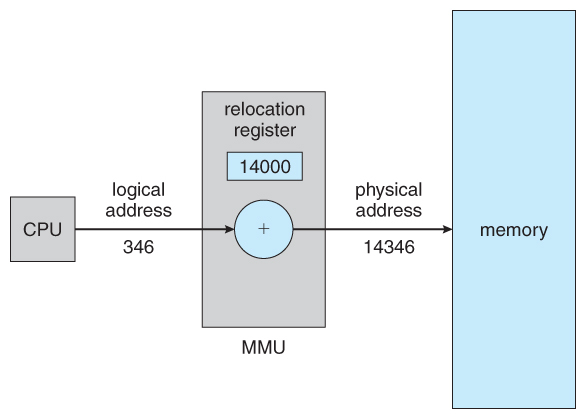 The run time mapping of logical to physical addresses is handled by the memory-management unit, MMU. The MMU can take on many forms. One of the simplest is a modification of the base-register scheme described earlier. The base register is now termed a relocation register, whose value is added to every memory request at the hardware level. Note that user programs never see physical addresses. User programs work entirely in logical address space, and any memory references or manipulations are done using purely logical addresses. Only when the address gets sent to the physical memory chips is the physical memory address generated. Rather than loading an entire program into memory at once, dynamic loading loads up each routine as it is called. The advantage is that unused routines need never be loaded, reducing total memory usage and generating faster program startup times. The downside is the added complexity and overhead of checking to see if a routine is loaded every time it is called and then then loading it up if it is not already loaded. 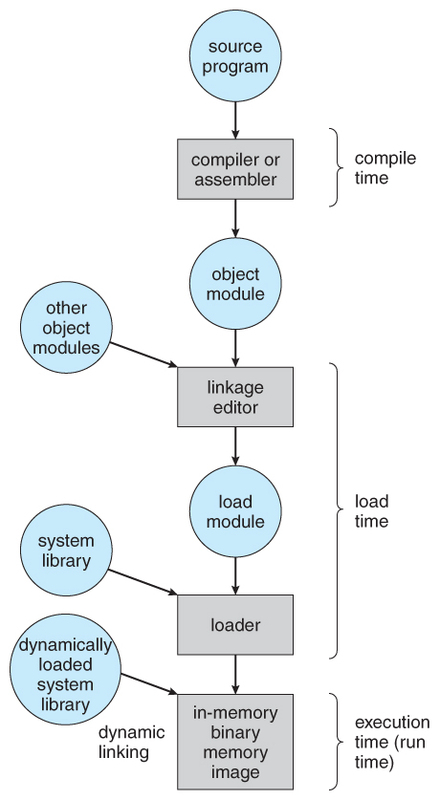 With static linking library modules get fully included in executable modules, wasting both disk space and main memory usage, because every program that included a certain routine from the library would have to have their own copy of that routine linked into their executable code. With dynamic linking, however, only a stub is linked into the executable module, containing references to the actual library module linked in at run time. This method saves disk space, because the library routines do not need to be fully included in the executable modules, only the stubs. We will also learn that if the code section of the library routines is reentrant, ( meaning it does not modify the code while it runs, making it safe to re-enter it ), then main memory can be saved by loading only one copy of dynamically linked routines into memory and sharing the code amongst all processes that are concurrently using it. ( Each process would have their own copy of the data section of the routines, but that may be small relative to the code segments. ) Obviously the OS must manage shared routines in memory. An added benefit of dynamically linked libraries ( DLLs, also known as shared libraries or shared objects on UNIX systems ) involves easy upgrades and updates. When a program uses a routine from a standard library and the routine changes, then the program must be re-built ( re-linked ) in order to incorporate the changes. However if DLLs are used, then as long as the stub doesn't change, the program can be updated merely by loading new versions of the DLLs onto the system. Version information is maintained in both the program and the DLLs, so that a program can specify a particular version of the DLL if necessary. A process must be loaded into memory in order to execute. If there is not enough memory available to keep all running processes in memory at the same time, then some processes who are not currently using the CPU may have their memory swapped out to a fast local disk called the backing store. If compile-time or load-time address binding is used, then processes must be swapped back into the same memory location from which they were swapped out. If execution time binding is used, then the processes can be swapped back into any available location. Swapping is a very slow process compared to other operations. For example, if a user process occupied 10 MB and the transfer rate for the backing store were 40 MB per second, then it would take 1/4 second ( 250 milliseconds ) just to do the data transfer. Adding in a latency lag of 8 milliseconds and ignoring head seek time for the moment, and further recognizing that swapping involves moving old data out as well as new data in, the overall transfer time required for this swap is 512 milliseconds, or over half a second. For efficient processor scheduling the CPU time slice should be significantly longer than this lost transfer time. 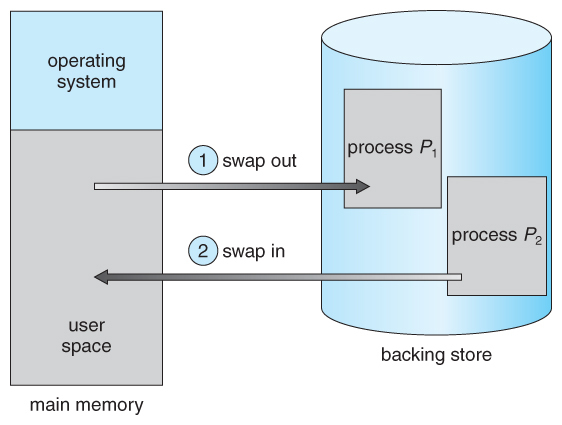 To reduce swapping transfer overhead, it is desired to transfer as little information as possible, which requires that the system know how much memory a process is using, as opposed to how much it might use. Programmers can help with this by freeing up dynamic memory that they are no longer using. It is important to swap processes out of memory only when they are idle, or more to the point, only when there are no pending I/O operations. ( Otherwise the pending I/O operation could write into the wrong process's memory space. ) 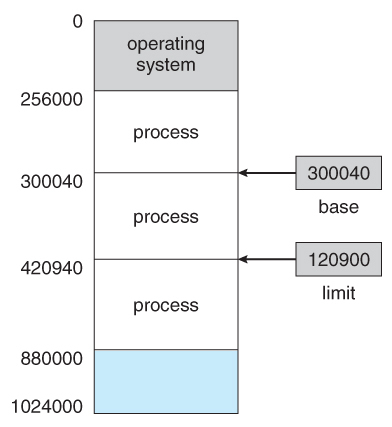 The solution is to either swap only totally idle processes, or do I/O operations only into and out of OS buffers, which are then transferred to or from process's main memory as a second step. Most modern OSes no longer use swapping, because it is too slow and there are faster alternatives available. ( e.g. Paging. ) However some UNIX systems will still invoke swapping if the system gets extremely full, and then discontinue swapping when the load reduces again. Windows 3.1 would use a modified version of swapping that was somewhat controlled by the user, swapping process's out if necessary and then only swapping them back in when the user focused on that particular window. Mobile devices typically use flash memory in place of more spacious hard drives for persistent storage, so there is not as much space available. Flash memory can only be written to a limited number of times before it becomes unreliable. The bandwidth to flash memory is also lower. Read-only data, e.g. code, is simply removed, and reloaded later if needed. Modified data, e.g. the stack, is never removed, but . . .
Android follows a similar strategy. Prior to terminating a process, Android writes its application state to flash memory for quick restarting. The system shown in Figure 8.6 below allows protection against user programs accessing areas that they should not, allows programs to be relocated to different memory starting addresses as needed, and allows the memory space devoted to the OS to grow or shrink dynamically as needs change. 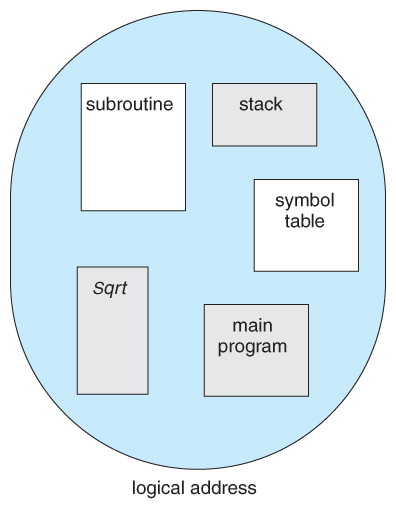 One method of allocating contiguous memory is to divide all available memory into equal sized partitions, and to assign each process to their own partition. This restricts both the number of simultaneous processes and the maximum size of each process, and is no longer used. First fit - Search the list of holes until one is found that is big enough to satisfy the request, and assign a portion of that hole to that process. Whatever fraction of the hole not needed by the request is left on the free list as a smaller hole. Subsequent requests may start looking either from the beginning of the list or from the point at which this search ended. Best fit - Allocate the smallest hole that is big enough to satisfy the request. This saves large holes for other process requests that may need them later, but the resulting unused portions of holes may be too small to be of any use, and will therefore be wasted. Keeping the free list sorted can speed up the process of finding the right hole. Worst fit - Allocate the largest hole available, thereby increasing the likelihood that the remaining portion will be usable for satisfying future requests. Simulations show that either first or best fit are better than worst fit in terms of both time and storage utilization. First and best fits are about equal in terms of storage utilization, but first fit is faster. All the memory allocation strategies suffer from external fragmentation, though first and best fits experience the problems more so than worst fit. External fragmentation means that the available memory is broken up into lots of little pieces, none of which is big enough to satisfy the next memory requirement, although the sum total could. The amount of memory lost to fragmentation may vary with algorithm, usage patterns, and some design decisions such as which end of a hole to allocate and which end to save on the free list. Statistical analysis of first fit, for example, shows that for N blocks of allocated memory, another 0.5 N will be lost to fragmentation. Internal fragmentation also occurs, with all memory allocation strategies. This is caused by the fact that memory is allocated in blocks of a fixed size, whereas the actual memory needed will rarely be that exact size. For a random distribution of memory requests, on the average 1/2 block will be wasted per memory request, because on the average the last allocated block will be only half full. Note that the same effect happens with hard drives, and that modern hardware gives us increasingly larger drives and memory at the expense of ever larger block sizes, which translates to more memory lost to internal fragmentation. Some systems use variable size blocks to minimize losses due to internal fragmentation. If the programs in memory are relocatable, ( using execution-time address binding ), then the external fragmentation problem can be reduced via compaction, i.e. moving all processes down to one end of physical memory. This only involves updating the relocation register for each process, as all internal work is done using logical addresses. Another solution as we will see in upcoming sections is to allow processes to use non-contiguous blocks of physical memory, with a separate relocation register for each block. Most users ( programmers ) do not think of their programs as existing in one continuous linear address space. Rather they tend to think of their memory in multiple segments, each dedicated to a particular use, such as code, data, the stack, the heap, etc. 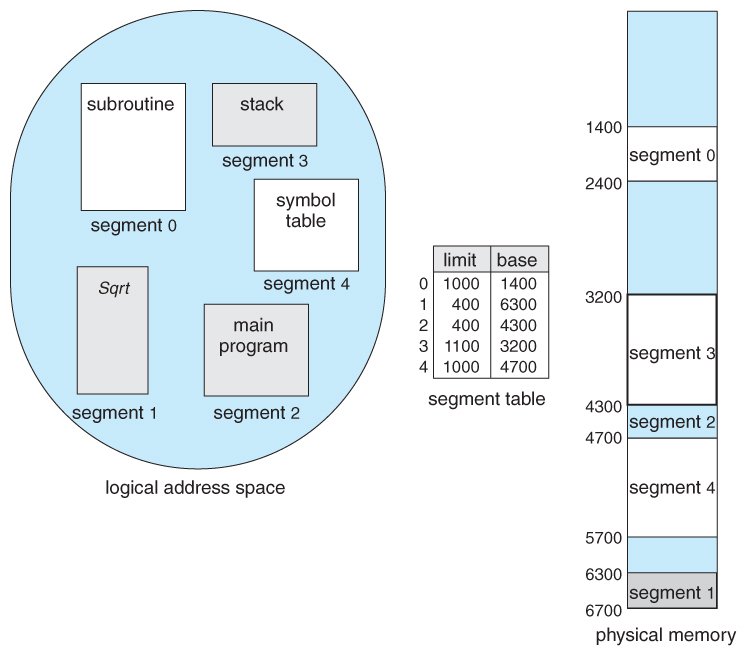 Memory segmentation supports this view by providing addresses with a segment number ( mapped to a segment base address ) and an offset from the beginning of that segment. Figure 8.7 Programmer's view of a program. 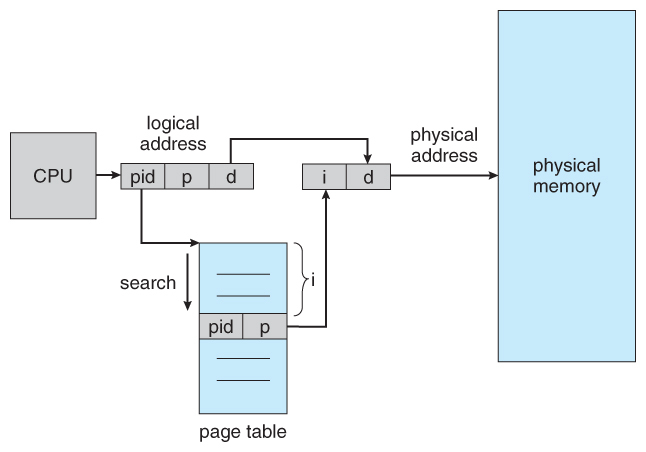 Paging is a memory management scheme that allows processes physical memory to be discontinuous, and which eliminates problems with fragmentation by allocating memory in equal sized blocks known as pages. Paging eliminates most of the problems of the other methods discussed previously, and is the predominant memory management technique used today. 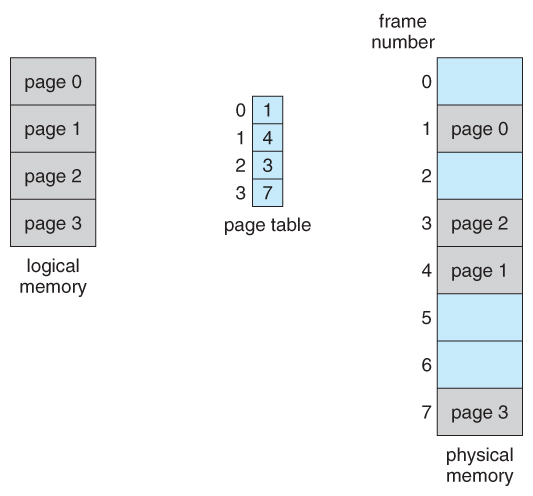 The basic idea behind paging is to divide physical memory into a number of equal sized blocks called frames, and to divide a programs logical memory space into blocks of the same size called pages. Any page ( from any process ) can be placed into any available frame. 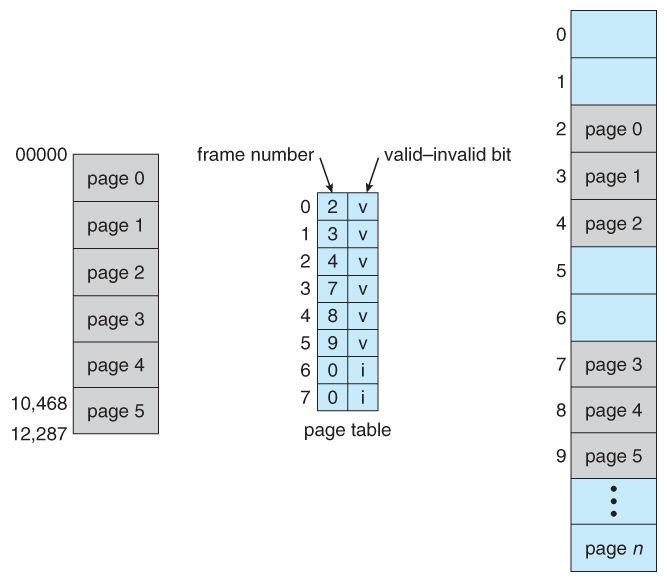 The page table maps the page number to a frame number, to yield a physical address which also has two parts: The frame number and the offset within that frame. The number of bits in the frame number determines how many frames the system can address, and the number of bits in the offset determines the size of each frame. Page numbers, frame numbers, and frame sizes are determined by the architecture, but are typically powers of two, allowing addresses to be split at a certain number of bits. For example, if the logical address size is 2^m and the page size is 2^n, then the high-order m-n bits of a logical address designate the page number and the remaining n bits represent the offset. Note also that the number of bits in the page number and the number of bits in the frame number do not have to be identical. The former determines the address range of the logical address space, and the latter relates to the physical address space. Note that paging is like having a table of relocation registers, one for each page of the logical memory. There is no external fragmentation with paging. All blocks of physical memory are used, and there are no gaps in between and no problems with finding the right sized hole for a particular chunk of memory. Larger page sizes waste more memory, but are more efficient in terms of overhead. Modern trends have been to increase page sizes, and some systems even have multiple size pages to try and make the best of both worlds. When a process requests memory ( e.g. 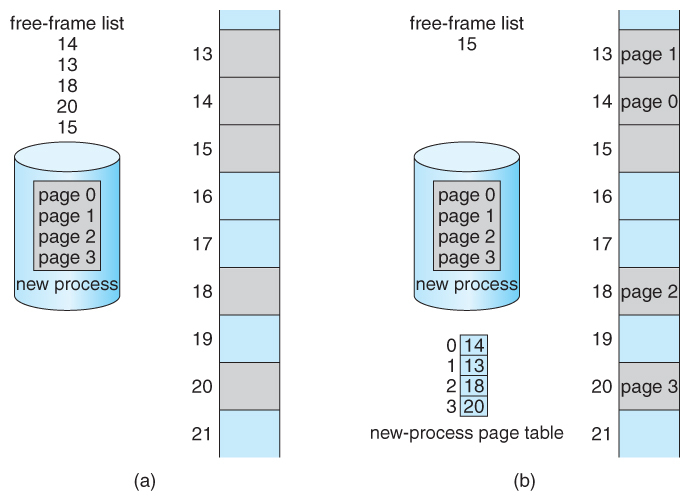 when its code is loaded in from disk ), free frames are allocated from a free-frame list, and inserted into that process's page table. Processes are blocked from accessing anyone else's memory because all of their memory requests are mapped through their page table. There is no way for them to generate an address that maps into any other process's memory space. 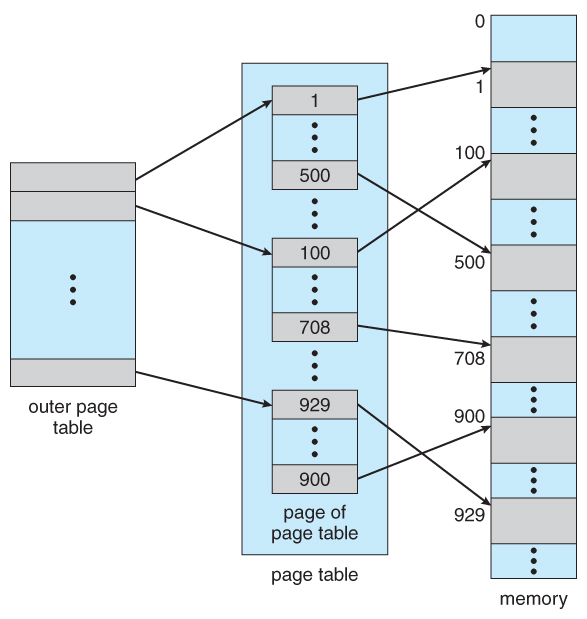 Page lookups must be done for every memory reference, and whenever a process gets swapped in or out of the CPU, its page table must be swapped in and out too, along with the instruction registers, etc. It is therefore appropriate to provide hardware support for this operation, in order to make it as fast as possible and to make process switches as fast as possible also. 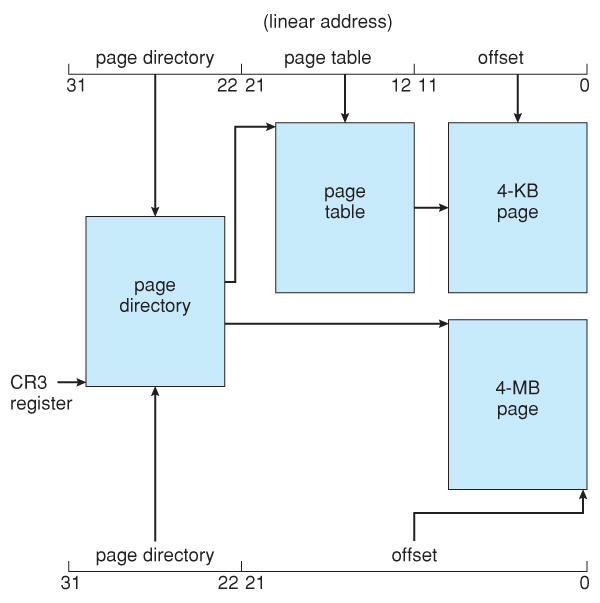 An alternate option is to store the page table in main memory, and to use a single register ( called the page-table base register, PTBR ) to record where in memory the page table is located. Process switching is fast, because only the single register needs to be changed. However memory access just got half as fast, because every memory access now requires two memory accesses - One to fetch the frame number from memory and then another one to access the desired memory location. The solution to this problem is to use a very special high-speed memory device called the translation look-aside buffer, TLB. The benefit of the TLB is that it can search an entire table for a key value in parallel, and if it is found anywhere in the table, then the corresponding lookup value is returned. The TLB is very expensive, however, and therefore very small. ( Not large enough to hold the entire page table. ) It is therefore used as a cache device. Addresses are first checked against the TLB, and if the info is not there ( a TLB miss ), then the frame is looked up from main memory and the TLB is updated. If the TLB is full, then replacement strategies range from least-recently used, LRU to random. Some TLBs allow some entries to be wired down, which means that they cannot be removed from the TLB. Typically these would be kernel frames. Some TLBs store address-space identifiers, ASIDs, to keep track of which process "owns" a particular entry in the TLB. This allows entries from multiple processes to be stored simultaneously in the TLB without granting one process access to some other process's memory location. Without this feature the TLB has to be flushed clean with every process switch. The percentage of time that the desired information is found in the TLB is termed the hit ratio. for a 40% slowdown to get the frame number. A 98% hit rate would yield 122 nanoseconds average access time ( you should verify this ), for a 22% slowdown. for a 20% slowdown to get the frame number. A 99% hit rate would yield 101 nanoseconds average access time ( you should verify this ), for a 1% slowdown. The page table can also help to protect processes from accessing memory that they shouldn't, or their own memory in ways that they shouldn't. A bit or bits can be added to the page table to classify a page as read-write, read-only, read-write-execute, or some combination of these sorts of things. Then each memory reference can be checked to ensure it is accessing the memory in the appropriate mode. Valid / invalid bits can be added to "mask off" entries in the page table that are not in use by the current process, as shown by example in Figure 8.12 below. 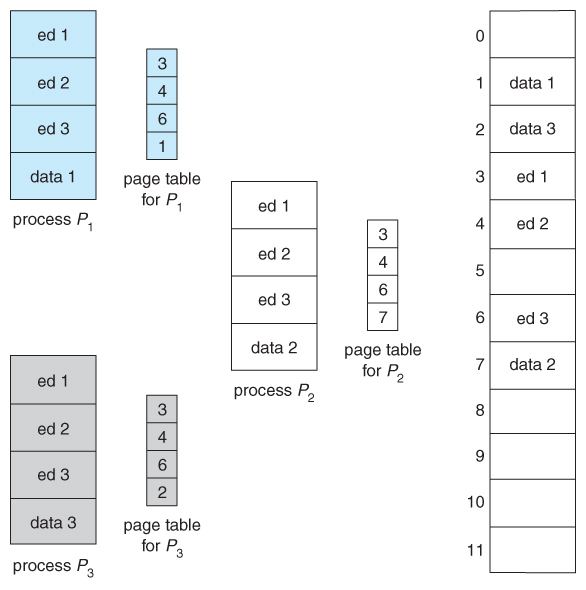 Many processes do not use all of the page table available to them, particularly in modern systems with very large potential page tables. 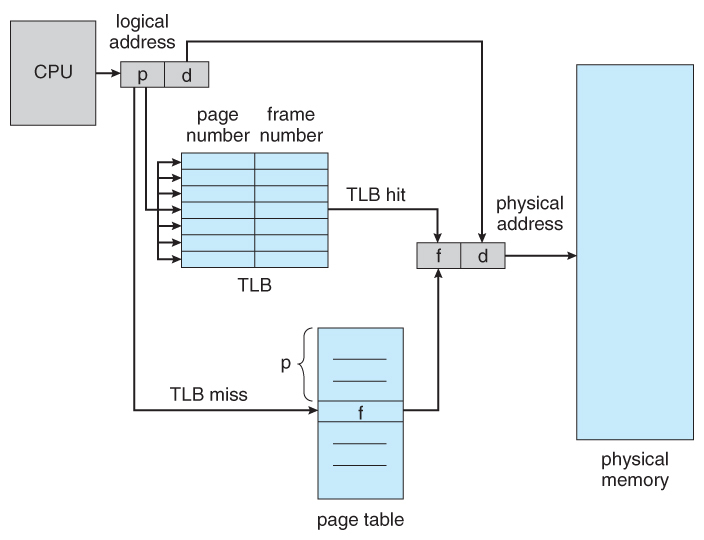 Rather than waste memory by creating a full-size page table for every process, some systems use a page-table length register, PTLR, to specify the length of the page table. Paging systems can make it very easy to share blocks of memory, by simply duplicating page numbers in multiple page frames. This may be done with either code or data. If code is reentrant, that means that it does not write to or change the code in any way ( it is non self-modifying ), and it is therefore safe to re-enter it. More importantly, it means the code can be shared by multiple processes, so long as each has their own copy of the data and registers, including the instruction register. In the example given below, three different users are running the editor simultaneously, but the code is only loaded into memory ( in the page frames ) one time. Some systems also implement shared memory in this fashion. Most modern computer systems support logical address spaces of 2^32 to 2^64. With a 2^32 address space and 4K ( 2^12 ) page sizes, this leave 2^20 entries in the page table. At 4 bytes per entry, this amounts to a 4 MB page table, which is too large to reasonably keep in contiguous memory. ( And to swap in and out of memory with each process switch. ) Note that with 4K pages, this would take 1024 pages just to hold the page table! One option is to use a two-tier paging system, i.e. to page the page table. With a 64-bit logical address space and 4K pages, there are 52 bits worth of page numbers, which is still too many even for two-level paging. 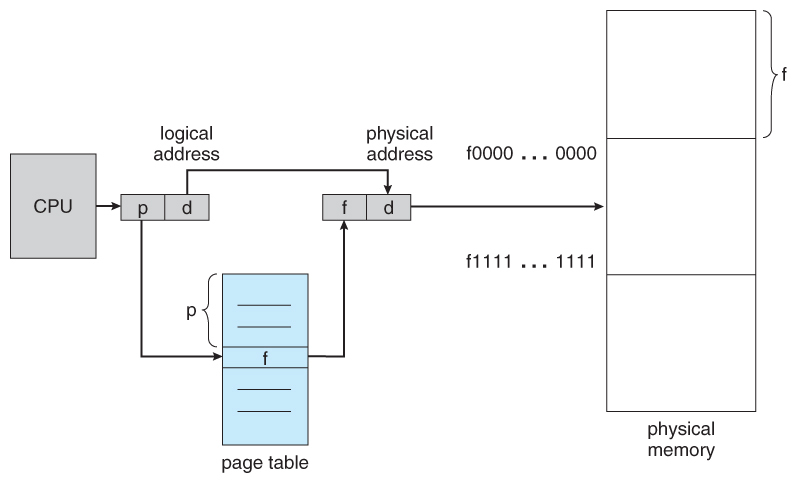 One could increase the paging level, but with 10-bit page tables it would take 7 levels of indirection, which would be prohibitively slow memory access. So some other approach must be used. Going to a fourth level still leaves 32 bits in the outer table. Access to an inverted page table can be slow, as it may be necessary to search the entire table in order to find the desired page ( or to discover that it is not there. ) 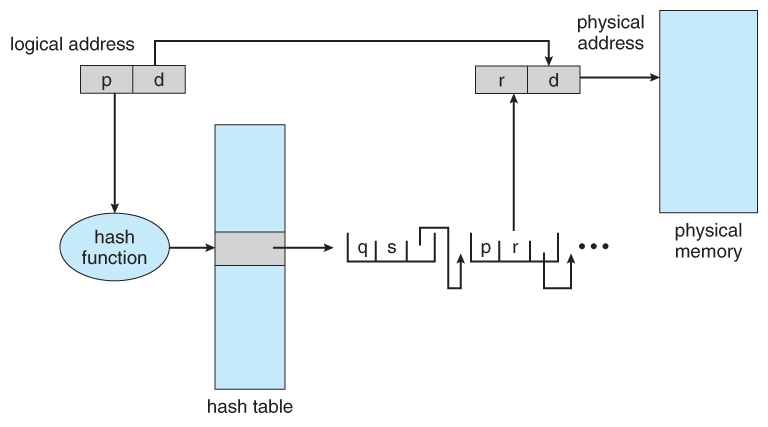 Hashing the table can help speedup the search process. The Pentium architecture allows segments to be as large as 4 GB, ( 24 bits of offset ). 8K private to that particular process, stored in the Local Descriptor Table, LDT. 8K shared among all processes, stored in the Global Descriptor Table, GDT. A 1 bit flag for LDT vs. GDT. 2 bits for protection codes. 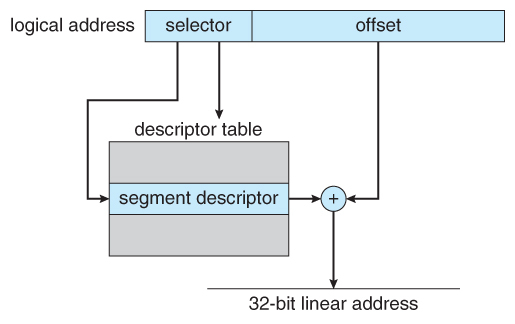 The descriptor tables contain 8-byte descriptions of each segment, including base and limit registers. 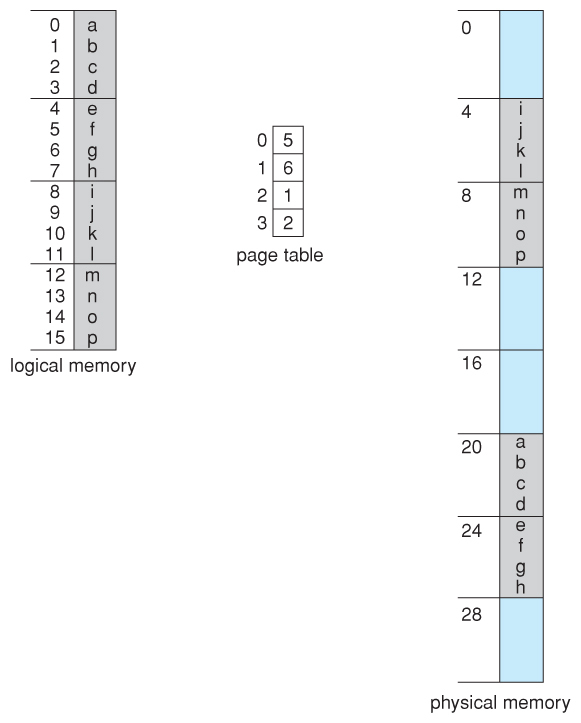 Pentium paging normally uses a two-tier paging scheme, with the first 10 bits being a page number for an outer page table ( a.k.a. 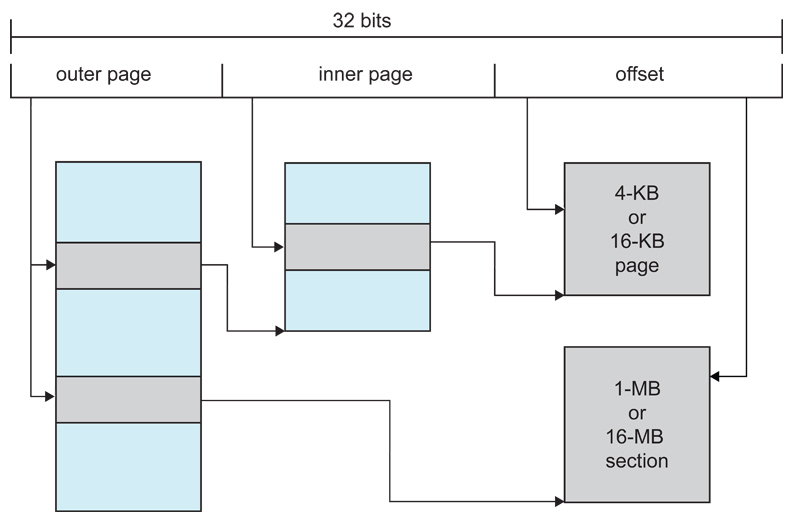 page directory ), and the next 10 bits being a page number within one of the 1024 inner page tables, leaving the remaining 12 bits as an offset into a 4K page. A special bit in the page directory can indicate that this page is a 4MB page, in which case the remaining 22 bits are all used as offset and the inner tier of page tables is not used. The CR3 register points to the page directory for the current process, as shown in Figure 8.23 below. If the inner page table is currently swapped out to disk, then the page directory will have an "invalid bit" set, and the remaining 31 bits provide information on where to find the swapped out page table on the disk. Figure 8.23 - Paging in the IA-32 architecture. Figure 8.24 - Page address extensions. Figure 8.25 - x86-64 linear address. Figure 8.26 - Logical address translation in ARM. Each process has its own TSS, whose descriptor is stored in the GDT. The TSS stores the hardware state of a process during context switches. The default LDT is shared by all processes and generally not used, but if a process needs to create its own LDT, it may do so, and use that instead of the default. The Pentium architecture provides 2 bits ( 4 values ) for protection in a segment selector, but Linux only uses two values: user mode and kernel mode. 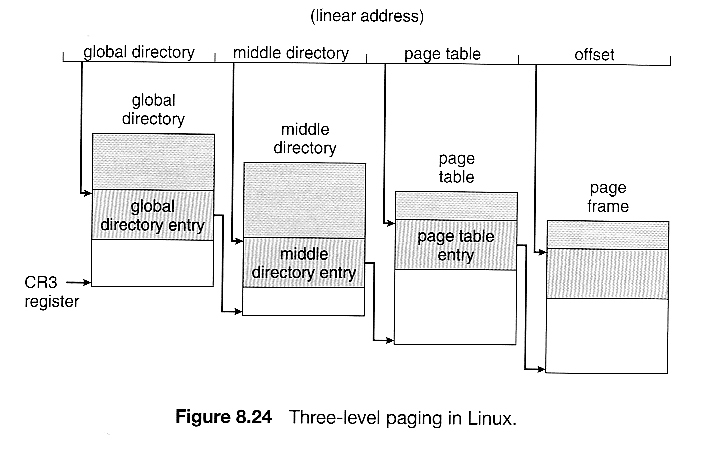 Because Linux is designed to run on 64-bit as well as 32-bit architectures, it employs a three-level paging strategy as shown in Figure 8.24, where the number of bits in each portion of the address varies by architecture. In the case of the Pentium architecture, the size of the middle directory portion is set to 0 bits, effectively bypassing the middle directory.